Steven Spielberg, his movies have not just changed Hollywood but shaped our lives. 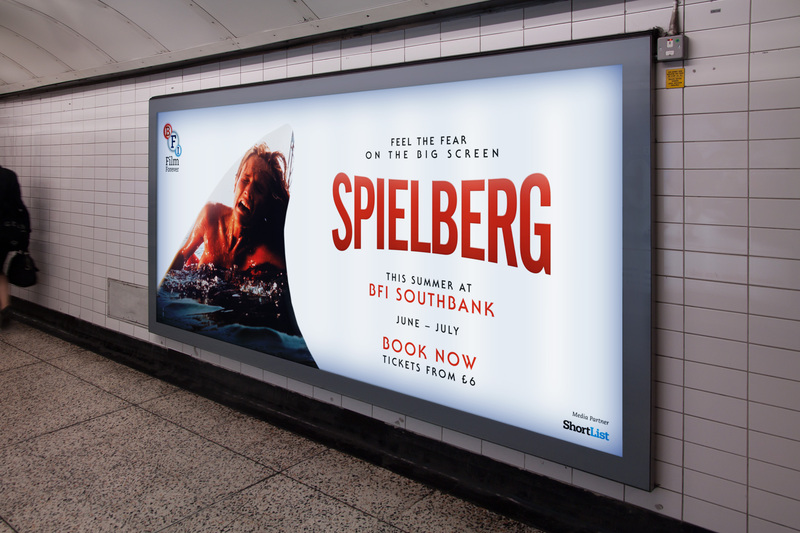 Throughout June and July the BFI have been spoiling us with an amazing season celebrating the films – and some television – of Steven Spielberg, covering everything from Duel (released theatrically here in Europe) to Amazing Stories and of course his summer blockbusters. Close Encounters, Indiana Jones, E.T. and the granddaddy of the modern summer blockbuster as we know it, Jaws. To accompany such a breadth of work, the BFI commissioned four pieces of work promoting the season utilizing striking and iconic imagery that is ingrained not just in film culture, but that of popular culture. Images were chosen from Jaws, E.T., Raiders of the Lost Ark and Jurassic Park, each riffing on a Spielberg classic that celebrates both the man and his movies. 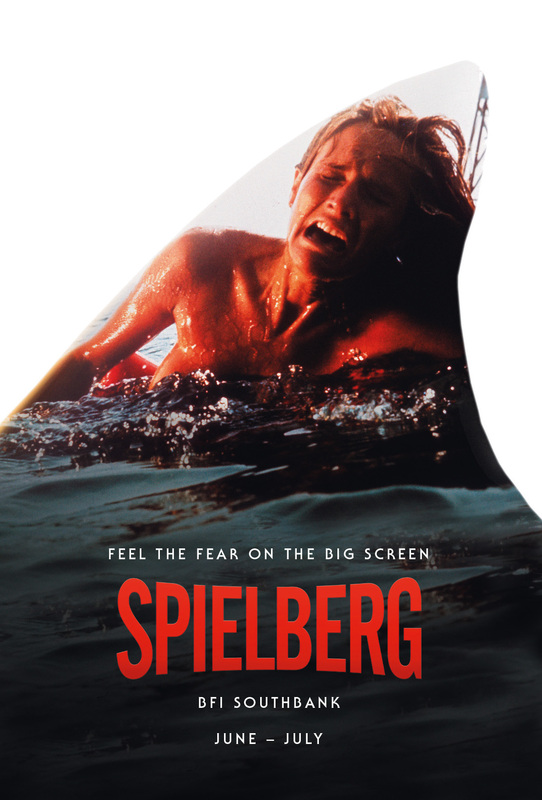 As a lifelong-Spielberg and Jaws fan, I, Dean Newman (DN), took the opportunity to interview its designer, Kyle Robertson (KR), who works for the BFI as part of their in-house design team, he’s also a senior digital designer and illustrator. DN: The four designs are simple yet inspired, how difficult was it coming up with a new take on such classics? 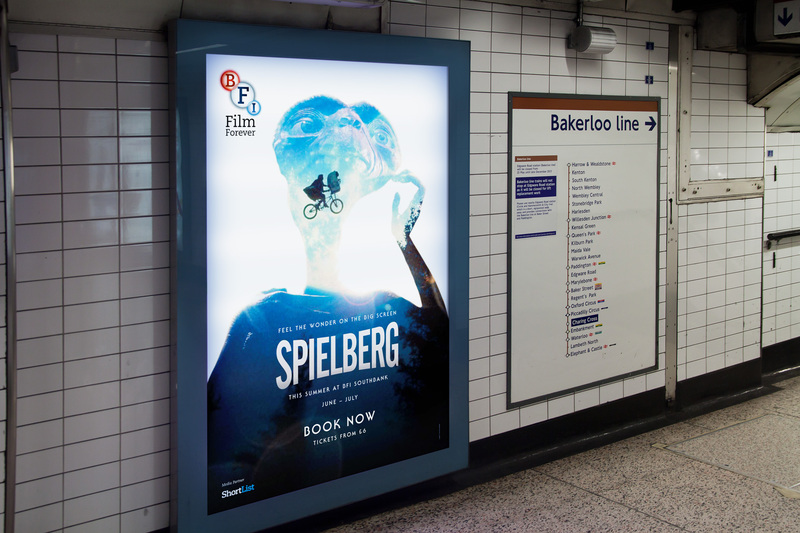 KR: The main objective of this campaign was to capture the iconic films of Spielberg. We decided to feature his well-known summer blockbusters; E.T, Jaws, Jurassic Park and Raiders of the Lost Ark. I wanted to design a suite of posters that would show these well-known movies in a new light, but also take people back to their childhood memories of seeing these for the first time. DN: Were you given these four films as design options or did you have any say? Was it only these four or were any others in contention, such as Schindler’s List or Close Encounters? KR: There was a long conversation over the titles we were going to feature. In the end we settled on his summer blockbusters due to the fact we were screening the season in the summer and wanted to create a lighter mood than say featuring Schindler’s List or Saving Private Ryan. DN: Jaws, Jurassic Park, Raiders and ET, classic films, classic scores but also classic posters. How did you approach these film posters and associated imagery that are so ingrained in our pop culture? KR: I started by watching the films again, doing a lot of reading and image research. Looking at the classic film posters, book covers, fan art, and everything else out there. This gives you a good idea of what works and what doesn’t. While designing the early sketches I would even listen to the soundtracks. The goal was to capture the essence of the film that everyone knows and loves, but come at it from a different angle. DN: Once you had the fin, dinosaur head, Indy’s head etc, were there several options for main images to be included in them? Any spring to mind? KR: We were limited in terms of imagery as we only used imagery from our own BFI Image Database, with exception for the Jurassic Park still which we got from the studio directly. We wanted to use iconic imagery that creates a certain mood. A good example was Jaws. Using the image of the woman in the water screaming within the shark fin shape stirs up all kinds of fear and emotion. We used these themes across the four designs. Fear for Jaws, wonder for E.T., Adventure for Raiders and Thrills for Jurassic Park. DN: Four posters for one season, normally I’ve only ever seen one, was it unusual to have so many? KR: It is quite unique to do several pieces of artwork for one season. Ordinarily we use just one poster for a season. But for big seasons which span several months there was an opportunity to do several. DN: Did you have to pitch for the job with the design we see or do you do a lot for the BFI? KR: Pitching for the work was not necessary as I work at the BFI as an in-house designer. DN: Which one are you most pleased with and why? My personal favourites are Jurassic Park and Jaws. KR: I like the concept of Jaws, but E.T is probably my favourite due to it being one of my favourite films and the colours work well. DN: Do you have many alternative designs/sketches/scamps that weren’t used? KR: Sorry, not allowed to share these designs, but yes many were created. Some photographic, some illustrative. DN: Have you heard any reaction from Spielberg himself, or anyone associated with him re the designs? KR: We worked very closely with Spielberg’s production company and Steven Spielberg had to sign off the artwork himself. The reaction was very positive. DN: You mention ET as being one of your favourite films, why that film? KR: It’s just a one-of-a-kind film that has everything; adventure, excitement, laughs and takes me right back to my childhood. I saw it recently at the BFI on the big screen and it still gives me chills watching the bikes take off with that amazing John Williams score. DN: What was the first Spielberg film you saw at the cinema and how old were you? KR: Jurassic Park was the first film I saw on the big-screen and I must have been 11. DN: There have been lots of great designers and artists work on Spielberg posters, such as Drew Struzan (Indy), John Alvin (E.T.) and Jaws (Roger Kastel). 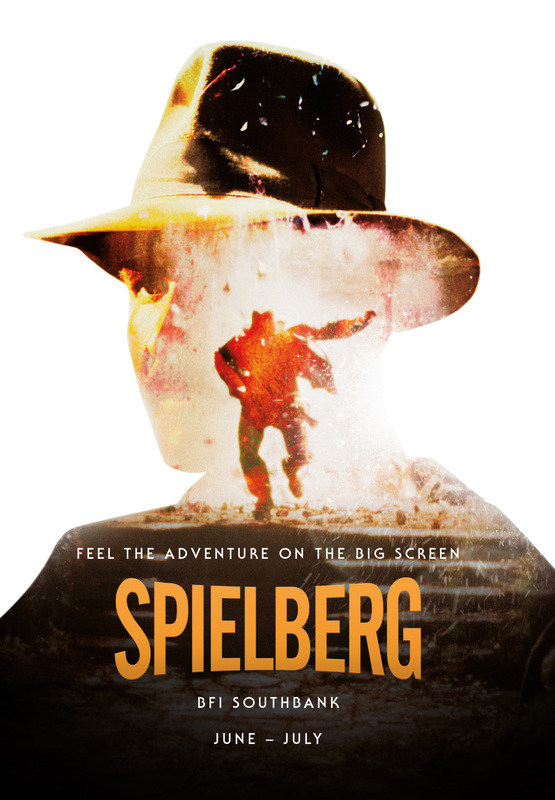 As a designer what’s your favourite Spielberg film poster and why? KR: The Drew Struzan posters for Indy are great. His style is so amazing and when you see his work you know it’s a Drew Struzan poster immediately. DN: What’s been the reaction across social media to your work? KR: The reaction to the work has been great. A lot of people making nice comments about it reminding them of their childhood and going to the movies which is great to hear. DN: The designs have an immediate impact, how was it seeing them writ large on the giant billboards? KR: I cycled past the Jaws billboard in Shoreditch and nearly fell off my bike when I first saw it. It’s a great feeling to see any artwork on a big scale, but the Jaws artwork looked very cool. DN: The posters – like many film posters today – rely heavily on photographic images, do you miss the era that the likes of Alvin, Struzan and Kastel were working in with their detailed artistic designs? KR: A lot of the BFI posters are based on photographic elements due to the nature of us portraying film and the moving image. We still do illustrative design work such as our current ‘Architecture on Film’ series. I am a big champion of the illustrative style and feel when handled correctly it can make a big impact. DN: I guess it’s the same with the James Bond posters – I loved the likes of The Living Daylights, the last of the art designs. It all seems to be Adobe Illustrator/Photoshop these days. Do you lament what some people see as the dying art of film posters? KR: I think it’s inevitable for methods and practices to change regarding this. In my experience this is mostly due to time restraints. To illustrate a poster takes a lot of time and what you have to remember about film season artwork is that it is hugely political and involves a huge amount of people’s input from many departments. So unfortunately there just isn’t the time to do this. We quite often pencil sketch concepts roughly and then take them into the Adobe suite to design and artwork. This gives you a huge amount of flexibility and freedom to work. DN: Any tips for anyone wanting to design posters? KR: You have to have a love of film naturally and spend most of your spare time watching films! You should also have a good knowledge of different design techniques and treatments. I try not to design the same thing twice. DN: What do you think makes a great film poster? KR: A simple but effective idea. Keep it fairly minimal. The more you add, the more the impact is lost from the design. DN: Are you working on any other exciting projects? KR: I am currently working on a big campaign for the BFI celebrating black talent in film. 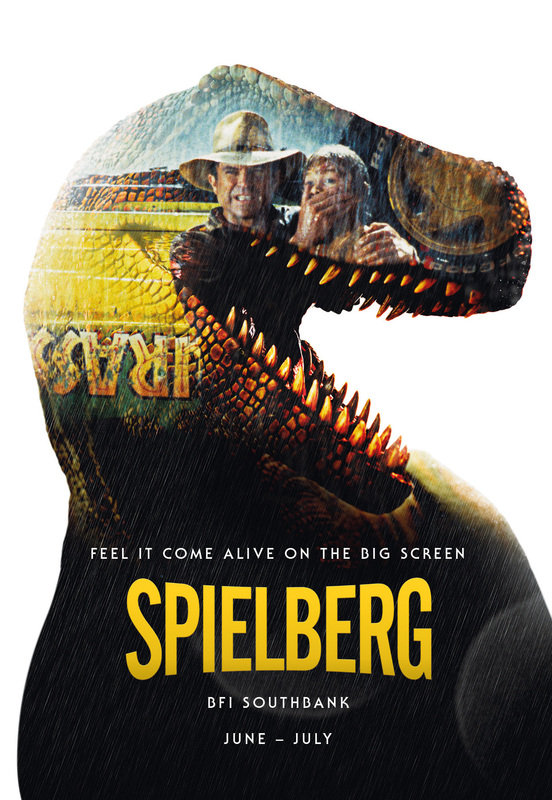 The Steven Spielberg season continues into July with cinematic delights to offer everyone, whether its Jurassic Park, Schindler’s List, Saving Private Ryan, A.I., Catch Me If You Can, War of the Worlds, Lincoln, The Lost World: Jurassic Park, Amistad, Minority Report, The Terminal, Munich, Bridge of Spies, The Adventures of Tintin – The Secret of the Unicorn and War Horse. Other highlights include a whole day devoted to the Indiana Jones films – Saturday 9 July – although they can also be caught individually across the month on other days as well, and there is also a very special screening of E.T. on Sunday 26 June which features a Q&A with producer Kathleen Kennedy – her first producing credit – and director Edgar Wright, who collaborated on Tintin. Access the remaining programme here. 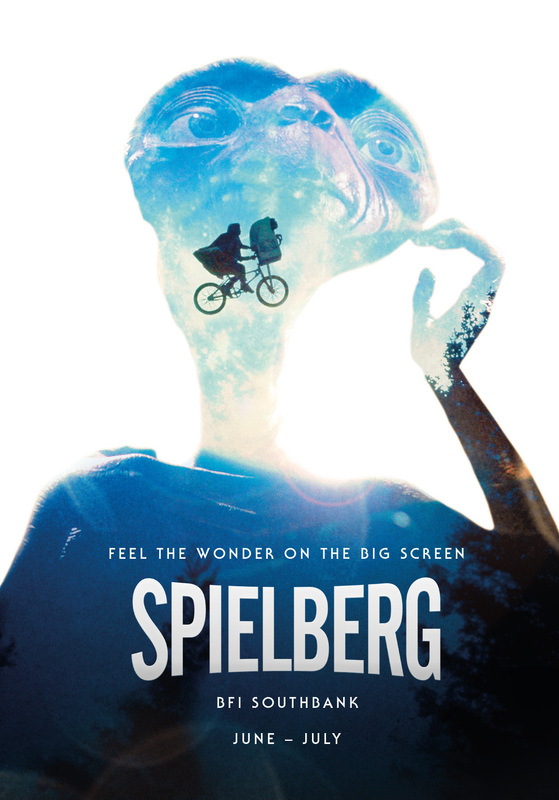 If your reaction to the Spielberg season posters designed by Kyle Robertson is as positive as the director himself, then you are in luck as you can now buy copies of the designs from the BFI Printstore. Credit belongs to the British Film Institute (BFI) for all images that appear in this article.